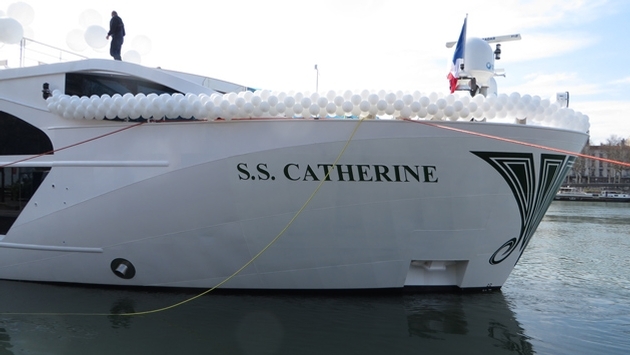 Uniworld, the upscale river cruise company, on March 27 will christen the 159-passenger S.S. Catherine, in Lyon, France. The ship’s godmother, French actress Catherine Deneuve, will lead the red- carpet event complete with a live band and a ceremonial breaking of a champagne bottle across the bow. 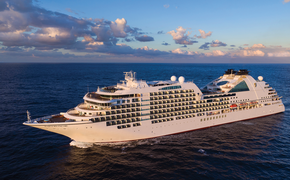 Similar to its sister ships S.S. Antoinette and River Beatrice, S.S. Catherine has been designed by Beatrice Tollman, president and founder of Uniworld’s sister company, The Red Carnation Hotel Collection; her daughter, Antoinette “Toni” Tollman; and Brian Brennan, projects director. The ship has 80 staterooms, five suites and one Royal Presidential Suite. French-inspired decorations include original commissioned artwork, a Murano chandelier in lobby alongside a glass elevator, and a waterfall cascading down one side. The ship also has 200 pieces of original artwork by well-known artists. The S.S. Catherine also has Uniworld’s signature Bar du Leopard, complete with a built-in movie theater and an indoor pool. Similar Leopard Lounges are found in several Red Carnation Hotels. The ship also has a Van Gogh main lounge complete with fireplace, a main Ce´zanne Restaurant (which serves gourmet cuisine sourced from local farmers’ markets), a bistro, coffee and tea bar, Serenity River Spa, and fitness center. S.S. Catherine will sail on Uniworld’s “Burgundy and Provence” and “Grand France” itineraries. See the following slide show for a preview of the ship’s public spaces, rooms and suites.